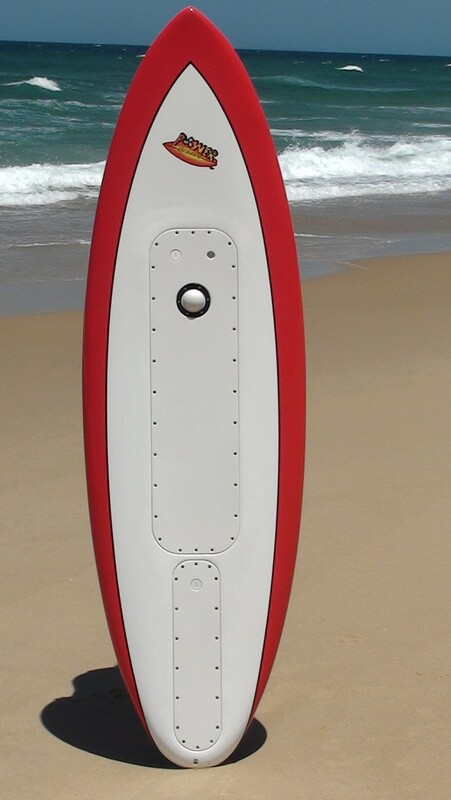 We have developed a motorized surfboard and surf rescue board. Our technology can be easily adapted to most water craft including surfboards, surf rescue boards, kayaks, stand up paddle boards and other water craft. Our products will allow the surfer to paddle through the surf using the assistance of a motor, therefore limiting the fatigue usually experienced by constant paddling when surfing. Our motorized rescue boards will improve response time and fatigue management in mass rescue situations. Our boards operate by simply pressing the button on the top of the board, either by laying down when paddling out, or by simply standing on the button whilst surfing if you want extra speed when surfing the wave. Once you are off the button the motor stops. Our products have been designed to enable them to be used with both the motor on and off, therefore once power has run low they can still be used as a normal surfboard/surf rescue board. Our boards are extremely quiet in the water. Our boards run for at least 35 minutes continuous run time. This equates to about one and a half to two hours in the water. The fin design does not affect the way the boards surf. The fin design acts as a jet unit in the water. We have direct forward thrust in the water, not downward thrust onto the water, therefore giving the board more power. The speed can be adjusted easily by a simple change of the propeller. We also have the ability to increase the speed of our boards immensely with a slight change of the components. We have developed prototypes and already have products for sale. We have all supplier information for each component of our boards. We have up to date manufacturing-ready component drawings of the components of our boards, as well as a set of procedures for the assembly of our boards. Our website details are www.powerboards1.com. We also have a YouTube channel at 'powerboards1'.